This view of a town from the far side of a river with an imposing church and probably school nearby might interest you. Is it Enniskillen? no it's Navan, Co Meath another Location Identified well done Niall McAuley . Niall also points to the canal lock in the right foreground and identifies it as Metge's Lock. Pretty sure we had this one before as well and it was enniskillen. I'll say Navan. In this Streetview, you can see both church towers. I can't get an angle from across the river, though. St. Mary's is from 1800s, I thought is looked more modern. Italianate belltower from 1870, per the NIAH. Maybe. I'm looking at this on a mobile so I can't see it very well and I've no streetview. You can see that canal lock on the OSI 25" map as "Metge's Lock". 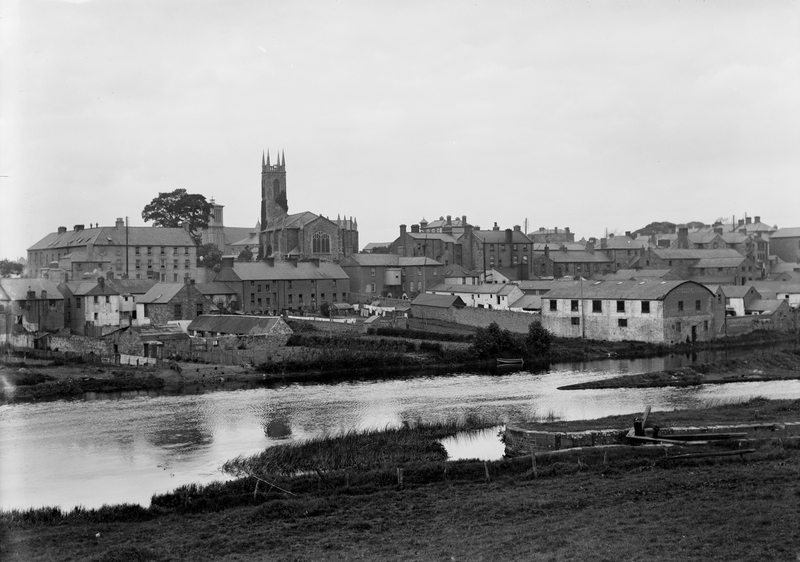 One from the NLI archive Lawrence collection, showing both church towers, taken from the railway bridge, I'd say. I see the little turret on Boyne House, built 1908. [https://www.flickr.com/photos/gnmcauley] This one is even closer in position to above! [http://www.flickr.com/photos/[email protected]] Nice! 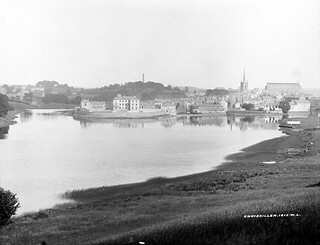 And Boyne house is NOT in that one, so it's before 1908. Not much change otherwise: the hedges and the creeper on the CoI church tower grow a bit. m.flickr.com/photos/[email protected]/ that's the one I've seen before. Did we have it on Flickr already or did I find it in the catalogue some other time? [http://www.flickr.com/photos/[email protected]] You might have seen it while researching Three boys in a boat just upstream. St. Mary's CoI is in that one, too. Or perhaps you are thinking of this one? [https://www.flickr.com/photos/gnmcauley] Here's a third in the sequence of photos over time: a postcard, sometime between 1959 (when Kennelly's started doing postcards) and 1970(when it was sent). It definitely reminded me of that one, niall, which is why I said enniskillen, but I've seen sharon's one before too. Lovely Vintage Image . Congrats with EXPLORE !! Great job everyone. Mary, what about the dogs??? [https://www.flickr.com/photos/gnmcauley] Well spotted! Even though I am a flickr Pro user, I do not understand Explore. Every now and then, people suddenly congratulate random photos for making Explore!!! But if I hit the Explore tab, I don't see them. It's a mystery to me. [https://www.flickr.com/photos/gnmcauley] I know! I was invited to submit the shot for Explore, accepted it and when I went looking for it could not find it:-) Having said that it is up to 6500 views today which is way above recent viewing numbers! [https://www.flickr.com/photos/whatsthatpicture] Thank you James and your wish is my command! Muy buena foto . Greetings from Valencia , Spain .